In their third Big East conference game of the season and home conference opener, DePaul (6-4-2; 2-1 Big East) hosted the Creighton Blue Jays on Sunday. 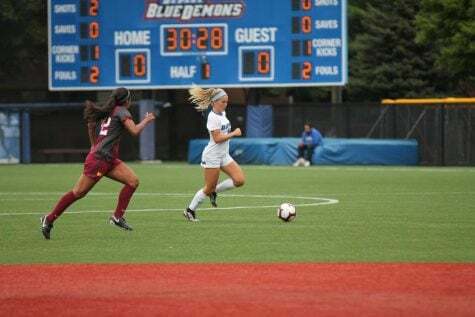 In an exciting back-and-forth game that saw great scoring scoring opportunities for each team, the Blue Demons prevailed in overtime with a 2-1 victory. 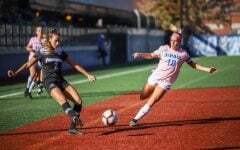 DePaul kept its perfect record against Creighton with Sunday’s win, improving to 6-0 all time and 2-0 in overtime. Both teams came into the game looking to rebound after tough losses on Thursday in conference play. Prior to this game both teams were in a six-way tie for third at 1-1 in the conference. Winning this game was vital for each squad. With that in mind, neither team held back after scoring just one point. The first half saw each team combine for 15 shots with both goalkeepers asked to make important saves. 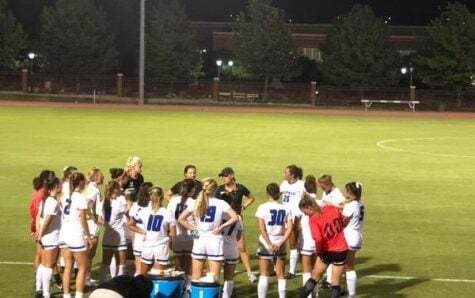 Creighton finally broke through in the 33rd minute after the Blue Demons couldn’t clear the ball and freshman goalie Mollie Eriksen saved a header off a corner. 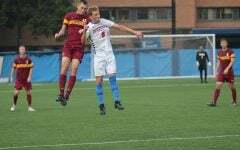 The Blue Jays kept the ball in the final third and a well timed cross connected with the head of junior forward Kylin Grubb who headed it past Eriksen. 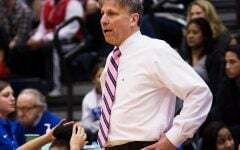 It didn’t take long for the Blue Demons to respond and create their own scoring opportunities. 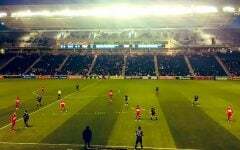 Two minutes after Creighton’s opening goal, Cerny had a great chance to equalize the game after a bad giveaway from Creighton. 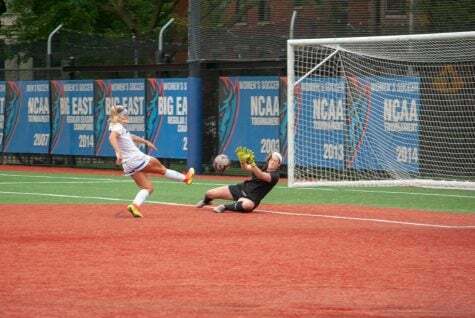 Cerny was through on goal, but her shot deflected off the hands of Creighton freshman goalie Katie Sullivan and hit the post. Afterward, Blue Jays were able to clear the ball. 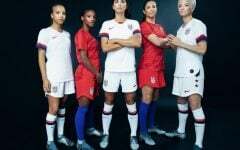 Then during the 38th minute Cerny had another chance to tie the game when sophomore defender Jessica Lazo played a long ball into the box, but Cerny had her shot saved again. Franny Cerny, senior forward, takes a shot at Creighton goalkeeper Katie Sullivan on Sunday at Wish Field. The Demons won 2-1 in overtime against the Bluejays. DePaul kept pressing in the first 45 minutes and ended up having 11 shots but weren’t clinical enough in the box to score a goal. They went into overtime with a 16-7 advantage in shots. This season he Blue Demons have become accustomed to having a lot of shots but not always being able to convert on those chances. 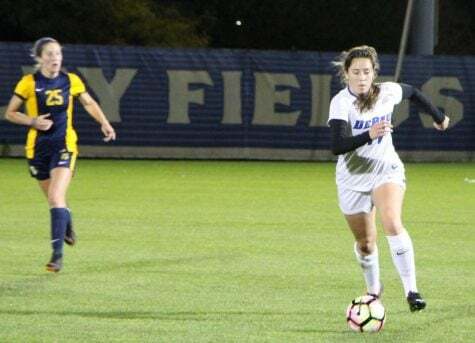 Against Georgetown on Thursday, the Blue Demons outshot Georgetown 10-8 and 8-5 in shots on goal, but they weren’t able to score and lost the game 3-0. Both teams had plenty of chances to win the game in 90 minutes, but good saves by each goalie kept the game even, forcing overtime. 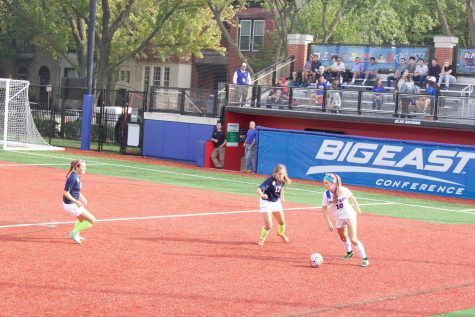 DePaul already played in two overtime games this season, both of which ended in draws. 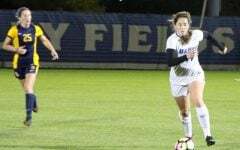 However, on Sunday the Blue Demons only needed six minutes to find the winner. 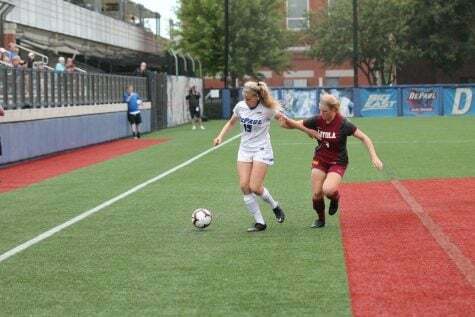 Sophomore forward Morgan Turner received the ball on the right flank, and with time to deliver the ball into the box she found her teammate senior midfielder Madeline Frick waiting at the back post. Once the ball finally got to Frick, she slammed the ball past Sullivan and three other defenders to find the back of the net. 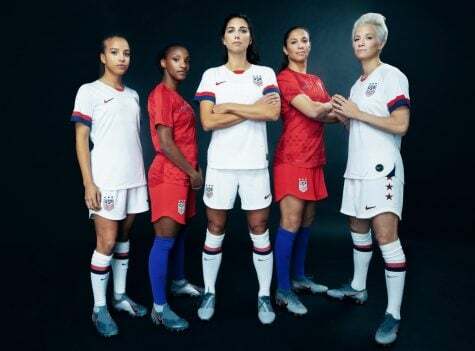 “I saw [Morgan] about to cross the ball and I was like I really wanted the game to be over, so I knew I had to get there for the goal,” Frick said. 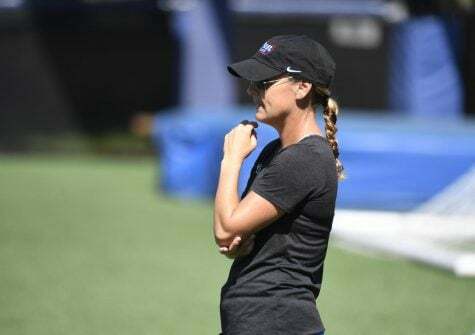 While DePaul managed to win their second Big East game of the season, head coach Erin Chastain said it wasn’t her team’s best performance. 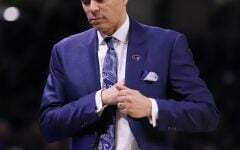 Creighton did a good job of frustrating the home team with their five in the back system and being aggressive with the Blue Demons. 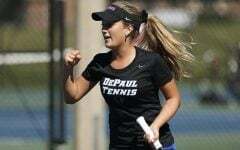 On Thursday DePaul will travel up North to take on Marquette who are ninth in the standings after three games.